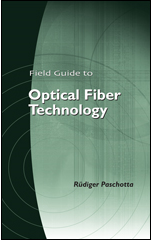 The RP Photonics Buyer's Guide contains 22 suppliers for fiber Bragg gratings. A fiber Bragg grating is a periodic or aperiodic perturbation of the effective refractive index in the core of an optical fiber (see Figure 1). Typically, the perturbation is approximately periodic over a certain length of e.g. a few millimeters or centimeters, and the period is of the order of hundreds of nanometers, or much longer for long-period fiber gratings (see below). where Λ is the grating period, λ is the vacuum wavelength, and neff is the effective refractive index of light in the fiber. Essentially, the condition means that the wavenumber of the grating matches the difference of the (opposite) wave vectors of the incident and reflected waves. In that case, the complex amplitudes corresponding to reflected field contributions from different parts of the grating are all in phase so that they can add up constructively; this is a kind of phase matching. 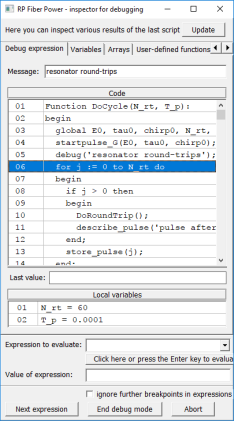 Even a weak index modulation (with an amplitude of e.g. 10−4) is sufficient for achieving nearly total reflection, if the grating is sufficiently long (e.g. a few millimeters). Light at other wavelengths, not satisfying the Bragg condition, is nearly not affected by the Bragg grating, except for some side lobes which frequently occur in the reflection spectrum (but can be suppressed by apodization of the grating, see below). The reflection bandwidth of a fiber grating, which is typically well below 1 nm, depends on both the length and the strength of the refractive index modulation. The narrowest bandwidth values, as are desirable e.g. for the construction of single-frequency fiber lasers or for certain optical filters, are obtained for long gratings with weak index modulation. Large bandwidths may be achieved with short and strong gratings, but also with aperiodic designs (see below). As the wavelength of maximum reflectance depends not only on the Bragg grating period but also on temperature and mechanical strain, Bragg gratings can be used in temperature and strain sensors. Transverse stress, as generated e.g. by squeezing a fiber grating between two flat plates, induces birefringence and thus polarization-dependent Bragg wavelengths. Figure 1: Schematic structure of a fiber Bragg grating (FBG). The fiber core has a periodically varying refractive index over some length. The drawing is not to scale; typical dimensions are 125 μm cladding diameter and 8 μm core diameter; periods of the refractive index gratings vary in the range of hundreds of nanometers or (for long-period gratings) hundreds of micrometers. 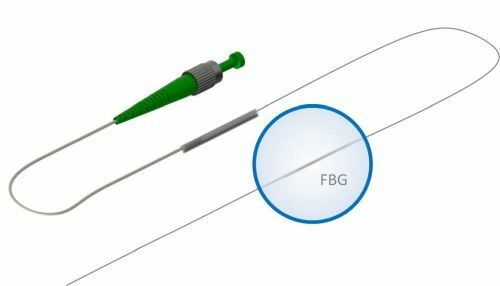 Most fiber Bragg gratings are used in single-mode fibers, and in that case the physical modeling is often relatively simple. The same formalism as for dielectric mirrors can in principle be used, in the simplest version assuming a rectangular index modulation and taking into account the limited overlap of the optical fields with the index-modulated region. However, the number of periods of the index modulation can become fairly large for long gratings, increasing the computation time. It may then be preferable to use a model based on mode coupling, leading to a pair of differential equations with a coupling term, the magnitude of which is related to the local strength of the index modulation. The coupling is then effectively assumed to be smoothly distributed, and the numerical integration is done with a step size which can be much larger than the grating period. Such methods can be used for calculating the frequency-dependent complex amplitudes for transmission and reflection of light. These reveal not only the fractions of reflected and transmitted power, but also (via numerical differentiation) the chromatic dispersion. Numerical models become substantially more complicated if many propagation modes are involved. Even for a single-mode fiber, it may be necessary to consider four modes (rather than just two counterpropagating modes) if birefringence is relevant, or even with a larger number of modes if coupling to cladding modes can occur. For multimode fibers, a multitude of core modes has to be accounted for. In such cases, the coupling coefficients depend not only on the amplitude of the index modulation, but also on the three-dimensional shape of the grating. Also, the wavelength of maximum reflection can differ between different modes, as the Bragg condition is influenced by the different propagation constants. Figure 2: Reflectance spectra of a 5.4 mm long FBG with different refractive index contrast, corresponding to different times of exposure to UV light. The side lobes of the reflectance curve, as observed for a high index contrast, could be removed by apodization, i.e., by reducing the index contrast towards the ends of the grating. The calculations have been made with the software RP Coating. It is also possible to apply numerical beam propagation techniques for the analysis of fiber Bragg gratings. This is particularly the case when there are no reflections, but only coupling between modes propagating in essentially the same direction – a typical situation for long-period Bragg gratings (with grading periods of the order of 1 mm, for example). (For cases involving counter propagating modes, beam propagation methods are much more difficult to apply.) Figure 3 shows an example for the case of a long-period fiber Bragg grating where the poling period has been chosen such that effective coupling from the fundamental mode to the LP03 mode is possible. Advantages of the fully numerical technique are that no complicated analytical calculations are required and that the typically involved simplifications of an analytical model (which may or may not be justified in practice) can be avoided. Figure 3: Intensity distribution inside the fiber Bragg grating. 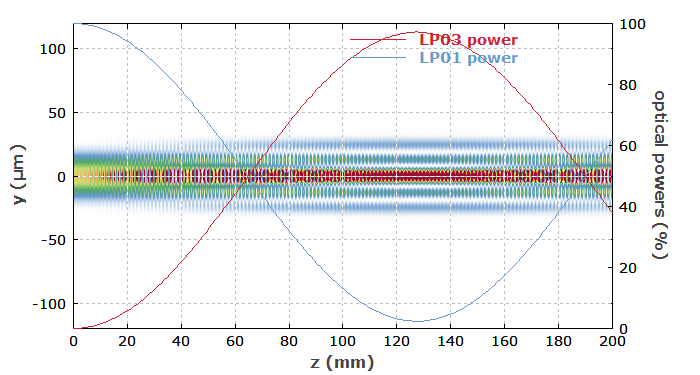 The red and blue curve shows the evolution of optical power in the LP03 mode and LP01 mode, respectively. This diagram has been taken from a case study on numerical beam propagation in fiber devices. If the strength of the index modulation in a grating is constant over some length, and suddenly drops to zero outside that range, the reflection spectrum exhibits side lobes, in particular if the peak reflectance is high (see Figure 2). These side lobes are sometimes disturbing, e.g. in some applications of fiber Bragg gratings as optical filters. They can be largely removed with the technique of apodization: the strength of the index modulation is smoothly ramped up and down along the grating. Of course, one then needs an increased overall length of the grating to achieve a certain peak reflectance. For the exact profile of the index modulation in an apodized fiber Bragg grating, there is a trade-off between optimum side-lobe suppression and maximum reflectance for some restricted grating length and a given maximum strength of index modulation. Telecom applications of FBGs often involve wavelength filtering, e.g. for combining or separating multiple wavelength channels in wavelength division multiplexing systems (add–drop multiplexers, OADM). Extremely narrow-band filters can be realized e.g. with long FBGs (having a length of up to about a meter, see Ref. ) or with combinations of such gratings. There are also shorter FBGs with tunable center wavelength, e.g. via variable mechanical strain applied with a piezo transducer. With such technology one can realize tunable optical filters. 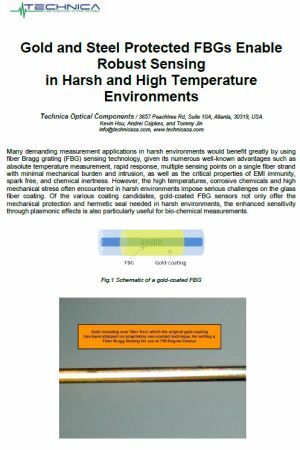 FBGs can be used as end mirrors of fiber lasers (→ distributed Bragg reflector lasers, DBR fiber lasers), then typically restricting the emission to a very narrow spectral range. Even single-frequency operation can be achieved e.g. by having the whole laser resonator formed by an FBG with a phase shift in the middle (→ distributed feedback lasers). Outside a laser resonator, an FBG can serve as a wavelength reference e.g. for stabilization of the laser wavelength. This method can also be applied for wavelength-stabilized laser diodes. Applications of chirped gratings are discussed in the next section. If the polarization of the writing beams is perpendicular to the fiber axis, there can be a significant deviation between the Bragg wavelengths for both polarization directions (i.e. a birefringence). This may be used e.g. for fabricating rocking filters. The range of interesting phenomena in FBGs is further enriched by the occurrence of optical nonlinearities, but these are not yet widely exploited. Fiber gratings with aperiodic index modulation can have interesting properties, such as reflectance curves without side lobes, multiple tailored reflection bands, or special chromatic dispersion profiles. Particularly for dispersion compensation, so-called chirped fiber gratings are used , where the Bragg wavelength varies with position. It is possible e.g. 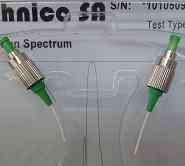 to achieve very large group delay dispersion in a short length of fiber, sufficient for compensating the dispersion of a long span of transmission fiber in an optical fiber communications system. Another application is pulse compression, e.g. within a chirped-pulse amplifier system. Chirped fiber gratings are also interesting for application as distributed fiber-optic sensors with intragrating sensing, i.e., monitoring e.g. the temperature along the length of the device. Typical FBGs have grating periods of a few hundred nanometers, coupling counterpropagating waves in the core. A second possibility is to use long-period Bragg gratings (LPG) [11, 20] with periods of the order of hundreds of microns (often with tilted grating planes) and a length of a few centimeters. Such gratings can couple modes with the same propagation direction. For example, the fundamental mode of a multimode fiber can be coupled to a certain higher-order mode, or a core mode can be coupled to cladding modes propagating in a similar direction. In the latter case, the coupling effectively introduces propagation losses, because light in cladding modes normally experiences strong losses in the fiber coating. Such gratings are used for introducing carefully controlled wavelength-dependent losses, e.g. for gain equalization in erbium-doped fiber amplifiers, but are also used for fiber-optic sensing. Long-period gratings can even be achieved by pressing a short length of fiber against a plate with periodic grooves . This kind of grating is reversible and potentially tunable. 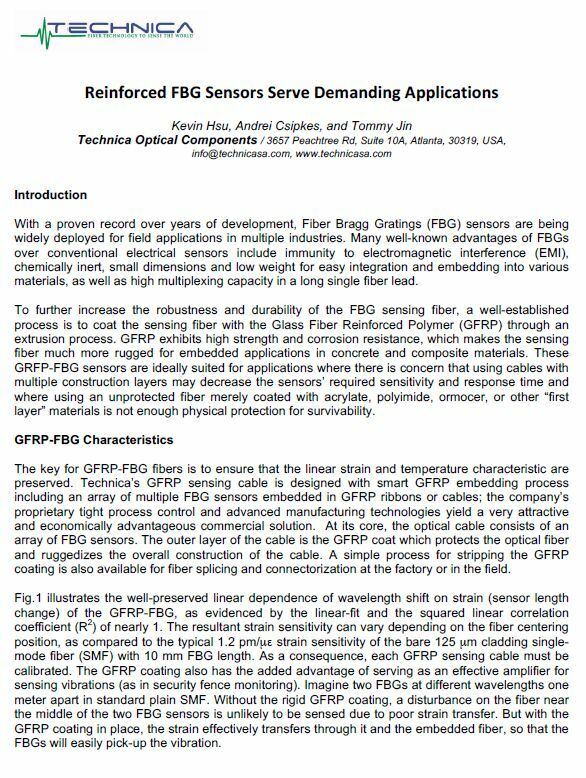 It is also possible to write FBGs in polymer optical fibers. As with silica fibers, one usually uses ultraviolet light, but the physical mechanisms are somewhat different. An advantage of Bragg gratings in polymer fibers is the larger wavelength tunability: polymer fibers can be stretched more strongly, and they react more strongly to temperature changes. The fabrication of fiber Bragg gratings typically involves the illumination of the core material with ultraviolet laser light (e.g. from a KrF or ArF excimer laser or other type of ultraviolet laser), which induces some structural changes and thus a permanent modification of the refractive index. The photosensitivity of the core glass is actually strongly dependent on the chemical composition and the UV wavelength: silica glass (as is often used for the cladding) has a very weak photosensitivity, whereas germanosilicate glass exhibits a much stronger effect, making possible a refractive index contrast up to ≈ 10−3. A significant further increase in photosensitivity is possible by loading the fiber with hydrogen (hydrogenated fibers). (For that purpose, the fiber is kept in a high-pressure hydrogen atmosphere for some time.) Phosphate glasses are normally regarded as unsuitable for FBG fabrication, but special methods make this possible . The first fiber Bragg gratings  were fabricated with a visible laser beam propagating along the fiber core, but in 1989 a more versatile technique was demonstrated by G. Meltz et al. , using the interferometric superposition of ultraviolet beams which come from the side of the fiber (transverse holographic technique). The angle between the ultraviolet beams determines the period of the light pattern in the fiber core and thus the Bragg wavelength. The two ultraviolet beams are often generated by exposing a periodic phase mask (photomask) with a single UV beam  (phase mask technique), using the two first-order diffracted beams. Non-periodic phase masks can be used to obtain more complicated patterns. Another technique is the point-by-point technique [23, 30], where the regions with increased refractive index are written point by point with a small focused laser beam. This is an appropriate (and very flexible) technique particularly for long-period Bragg gratings (see above). Instead of ultraviolet light, infrared light in the form of intense femtosecond pulses can also be used for writing Bragg gratings  in various kinds of glasses. In that case, two-photon absorption occurs near the focus of the laser beam, but not in regions outside the focus. It is even possible to write such gratings through the polymer coating of a fiber , since the intensity in the coating is much lower when the beam is focused to the fiber core. A totally different method also using infrared light is the fabrication of long-period FBGs in photonic crystal fibers by irradiation with a CO2 laser beam. Depending on the writing conditions, there are actually different physical mechanisms involved in the Bragg grating formation, and one distinguishes different types of gratings. Type I gratings are written with moderate intensities and exhibit an index grating right across the core. Type II gratings  can be written with much higher intensities within very short times, often with a single nanosecond pulse from an excimer laser (single-shot damage gratings). They can be written on the drawing tower  just before the fiber is coated, so that one avoids the process of removing an already fabricated coating, and obtains a grating with the full mechanical strength of ordinary fiber. Fiber Bragg gratings are fairly durable, but the degree of durability (e.g. the temperature at which the grating may be erased) depends strongly on the fiber material and the details of grating fabrication. The optical properties may change during some time after fabrication, before they settle at their final values. To reach a stable state more quickly, an annealing procedure can be applied, which typically means that the fiber is kept at some elevated temperature for a few hours. Premium quality fiber Bragg gratings and FBG arrays for customized sensors, polyimide-coated sensors to 300 °C, gold-coated hermetically sealed sensors, small-diameter FBGs, radiation hard/proof sensors, tilted FBGs, and high-temperature FBG sensors to 1000 °C. We also produce FBG matched pairs for fiber lasers and athermal FBG wavelength references.